For the second time this year, HP Inc has had to patch its laptops after a security researcher found a driver-level keylogger – and this time, other laptop-makers might have to check their own products. The debug trace was in the Synaptics Touchpad driver used almost across-the-board in HP laptops, and while it is turned off by default, a registry entry could turn it on. While few home users would be likely to turn it on, it would be a tasty exploit for RAT (remote access trojan) herders. The bug was disclosed by "ZwClose", who was looking through the driver to see if they could adjust the backlighting of HP laptop keyboards. 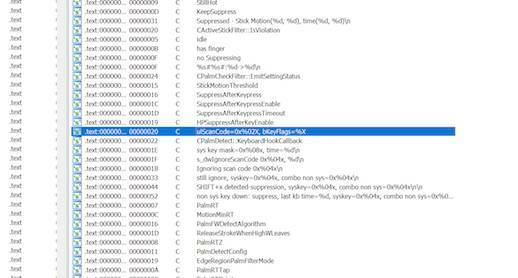 The revealing text: "uLScanCode=0x%02X, bKeyFlags=%X"
More digging showed that the driver "saved scan codes to a WPP trace" (Windows software trace preprocessor). HP acknowledged the issue, and issued updates for more than 173 commercial products and over 293 consumer products. ZwClose wrote that a fix would also land in Windows Update. Consumer items still awaiting a fix include eight HP Envy variants, an HP Stream series, as well as an HP x360 11 convertible.